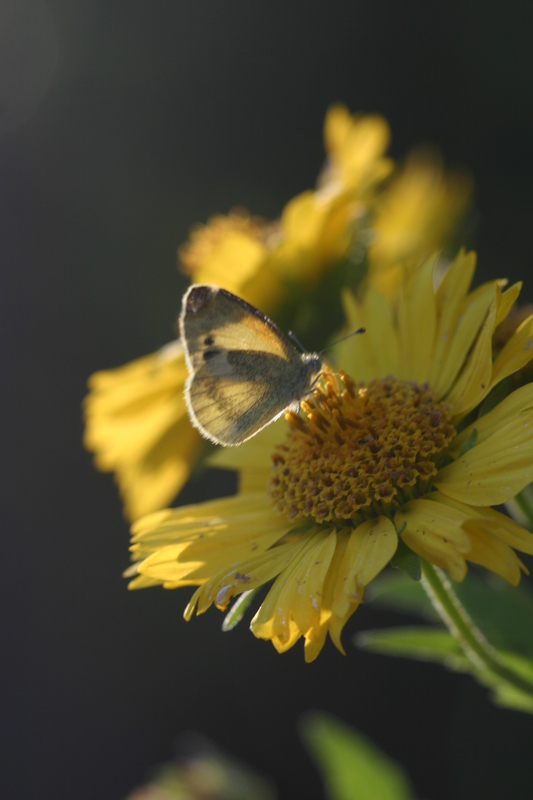 Sulfur butterfly catching last day light. In the blissful quiet of yesterday evening, I strolled around the house with the camera, hoping to capture images of the pretty Ashy Sunflower. I find most of them along fence lines and on the canyon rim. Evening sun allows for excellent back-lighting opportunities, so the natural sunlight was perfect. The day had been warm, with temperatures in the low 70’s. A few butterflies were busy flitting around on the flower heads. I chose to photograph a wide cluster of the flowers along the north fence just beyond our house. Sunflowers made a wonderful background for Em’s portrait. The Ashy Sunflower is considered a weed here in Oklahoma. (Though I tend to think of them as “prairie flowers”.) They are a simple weed and easy to manage. I have found the best weed control is usually hand-pulling but I do not know too many people who are ambitious enough to do the stooping and pulling, especially in the hot sun. 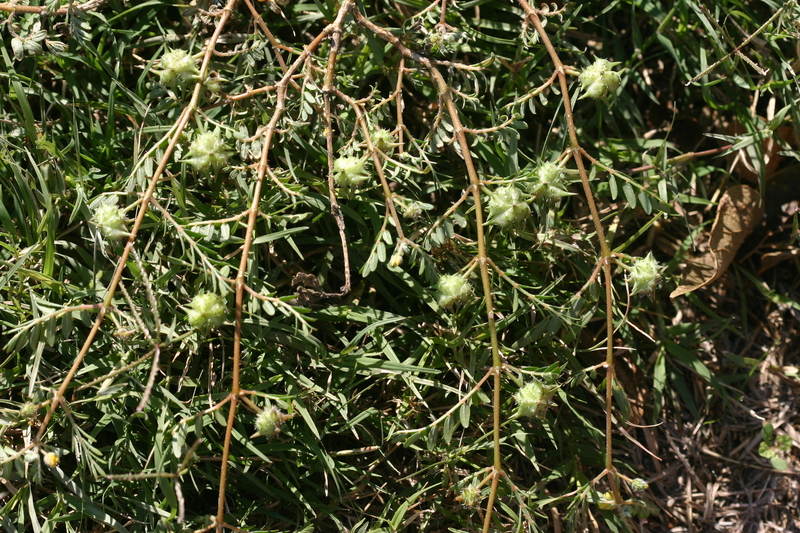 Chemical works well if applied early in the season, but by this time of year, plants have put on flowers and seeds are already broadcast in the wind. So, after a good rain, I get out there and pull weeds by hand. Most weeds go to the chickens. They love greens! The prickly-stemmed Buffalo Bur makes sure no one touches it! Back to my photography, I squatted down, camera low to the ground, snapping a shot here and there when I turned to see an odd-looking, yellow flower. It blended in with the sunflowers, but as I got closer I saw that it was one of those damnable Buffalo Burs. Grrr! I quickly went to the storage building to get my leather gardening gloves. This was no job for the wimpy, stretch-fabric gloves with the latex-coated fingers! Those burs would come right through that fabric. I reached down at the base and promptly yanked it from the soil. There! I plopped it in the trash bag I brought along. I looked around and sure enough, there was another one! I stalked over to the intruder and gave it a good pull and sent it to the depths of the trash bag as well. The Sand Bur lays flat to the ground not to be detected easily. I continued along the length of the fence, satisfied that I saw no additional perpetrators. But, while I was at this game, I decided to check a few places where for the last 5 years I had battled the equally-undesirable Sand Bur. Good heavens! Sure enough, there were several pale plants blending in with the nearly dormant grass. These horrible specimens were a real problem when we first moved on the property, but FD and I were diligent about hand pulling. We hop off the mower to pull them up. Mowing over them would scatter the bur heads all over the area! The burs are the seeds for next year. 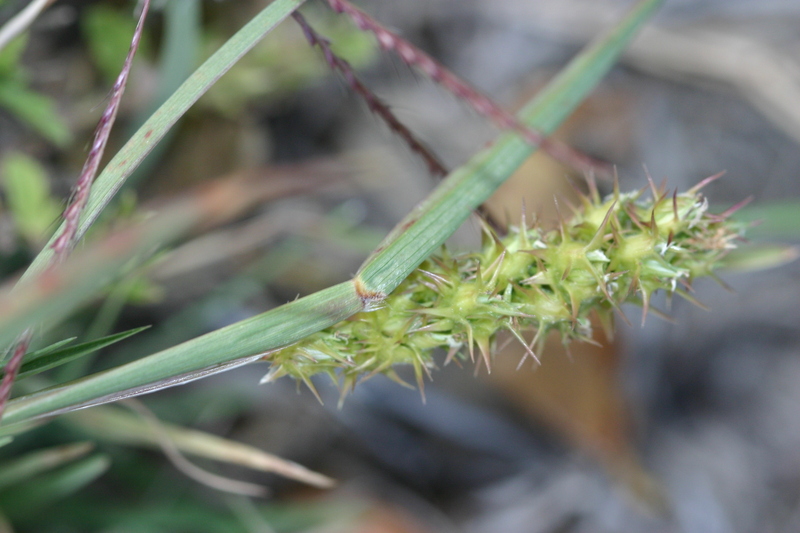 These Sand Bur plants are seen all over town. I have noticed them in neighborhood lawns, and in areas of the city park. I doubt most people research to understand how to eradicate them long-term. Once the bur plant is established, the only way to get rid of next years crop is to pull gently without disturbing the burs . Mowing just creates a bigger crop for next year. The innocent look of a most wicked weed! Finally, I walked back to the sunflowers and once again got the camera focused when, DADBURNIT! 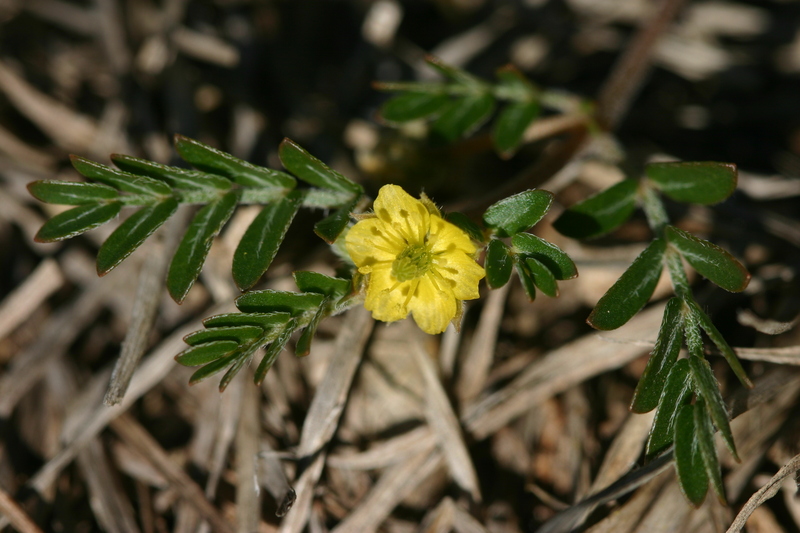 There was the most evil weed of all – the Puncturevine or, as its known around here, the Goat Head! Oh, sure, this vine appears to be a delicate friend. 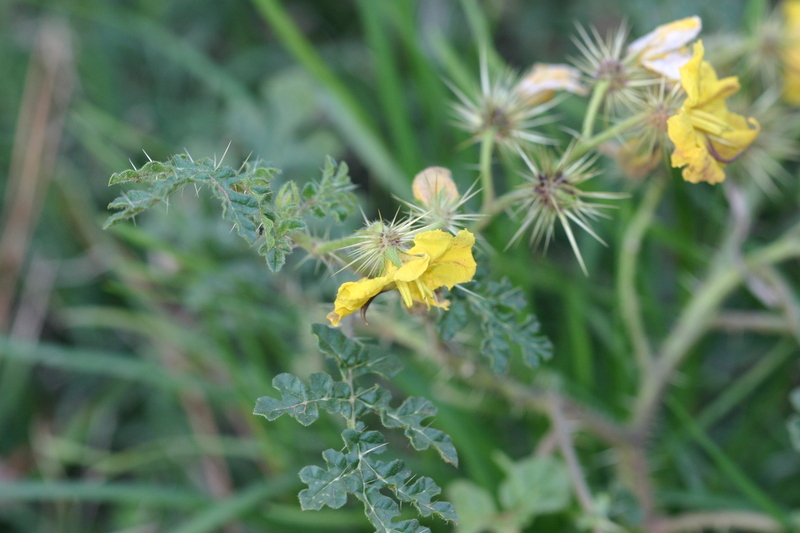 Surrounded by frilly leaves, it produces a tiny, yellow flower, but on the underside of the vine, there hides the “goat head” thorn-like seed pods. The goat heads are quick to attach themselves to moving objects. They are carried along on our shoes or in our tires, eventually dropping to the ground. Once they fall, the tiny seeds inside the thorn sit dormant, waiting for just the right conditions for growth. In fact, seeds can remain dormant for up to 20 years. Thankful for the moist ground from a recent rain, I began the painstaking work of locating the main stem and pulling CAREFULLY so that I did not loosen a goat head pod from the plant. Pretty soon I had a trash bag full of them. I had been fighting these wicked plants all summer near the alley but had not noticed them in this particular area. We had sprayed chemical the last two spring seasons and I thought we had them under control. 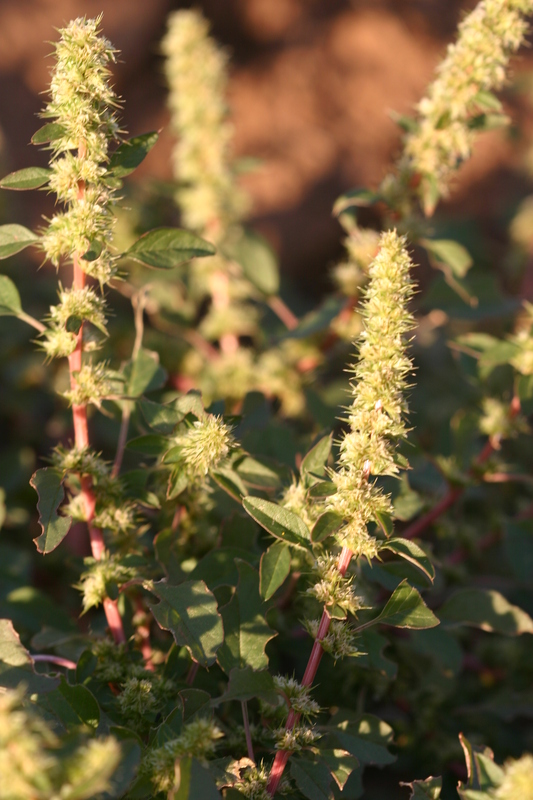 Spiney pigweed; another painful weed to pull. The thing is, I understand how weeds reproduce, but guests here often do not. When we go some place where we have walked in burs or stick-tites, we check ourselves over and pull off the offensive travelers looking to plant themselves in new territory. No one likes coming in the house walking around bare-footed, only to step on a bur of some type. I know guests think I’m the sticker or bur Nazi when I ask them to pull off the offenders and dispose of them in the trash. Last year two young nephews took off into the woods for some exploring. They came back completely covered in Catchweed Bedstraw, which is an invasive plant that tangles in everything on the woodland floor. The tiny, green, sticky ball-type seeds have small hooks on them and adhere to clothing and animal hair very effectively. For an hour we worked on the boys, getting every last seed ball off of them. I know they thought I was being an ogre about removal, but a little precaution goes a longway to prevention. The reason we don’t run barefooted around here! At sunset yesterday, I was still gently removing the Puncturevine from the lawn. I am determined for the moment, to get rid of those damnable burs. And ultimately, I know they’ll be back since those seeds from last year, and years before that, are still laying dormant, ready to germinate when it is their time. I know what you are saying. Your Dad taught you well. Lot’s of lessons from Dad growing up. I think staying with a project and doing it right has been most beneficial! I learned a lot under your loving hands… thanks Mom! I seem to be meeting some wonderful people via other bloggers. What an amazing childhood story. Just think how an obnoxious weed caused such a chain of events. I too, enjoy knowing I’m getting rid of the beastly plants, toting a huge trash sack with me, filling it with goat heads in just a couple of hours. I’m sure there are seed heads lurking about, awaiting just the right conditions for sprouting. As long as I’m able, I’ll be the “hatchet woman” ready to do battle! Beautiful shots of nature’s handywork – all of it! Why thank you… I was probably pushing it a little making weeds look good in photographs!